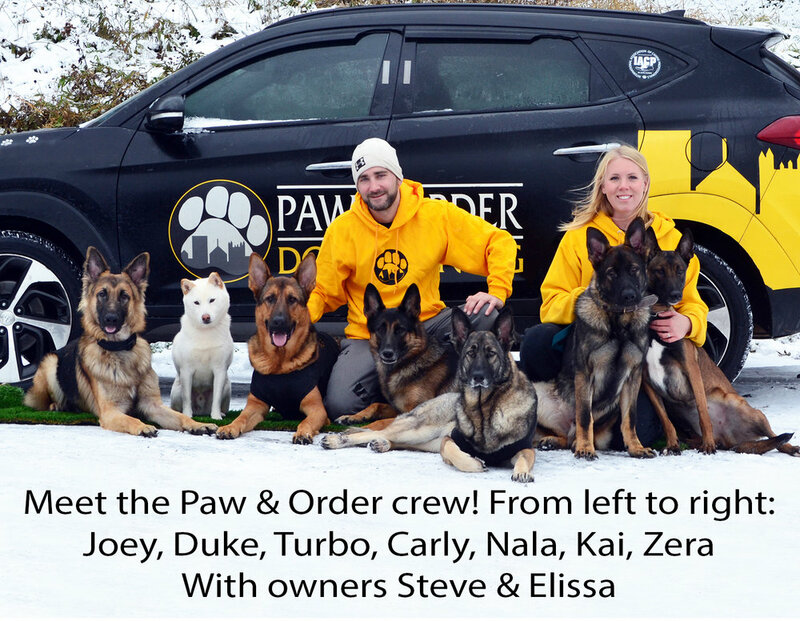 Paw & Order Dog Training is a locally owned and operated family business. We are passionate about dog training because we are passionate about dogs! We have four dogs of our own (not including our trainers' dogs) and they mean the world to us. We want everyone's dogs to be as well-behaved as ours because it enhances the relationship and bond between owner and dog. Three of our dogs were "problem" dogs whose owners were just as frustrated as you may be now. These dogs have all been through our training program and are now model citizens. We love being able to enjoy our happy, well-trained dogs and take them places without fear. Read their stories here. Once your dog learns what they are supposed to do, there are no limits. Contact us today to set up your no-obligation consultation. All trainers are put through our rigorous Train the Trainer protocol led by owner Elissa Weimer-Sentner. This is a 3 to 5 month program consisting of one-on-one coaching and shadowing with Elissa directly. Click the images below for more information on each trainer.